Orchestra awning fabric is a leader in the solar protection field. It guarantees a very high level of long-lasting protection from UV rays, heat, light and weather exposure. Its solution-dyed acrylic fiber and special outdoor awning coating provide excellent colorfastness over time, and a high level of resistance to water, tears and soiling. Orchestra awning fabric is recommended for all types of awnings, whatever their location. Some plain fabrics are available in widths of 165, 200, 250 and 200 cm. All products are sold in a width of 120 cm. 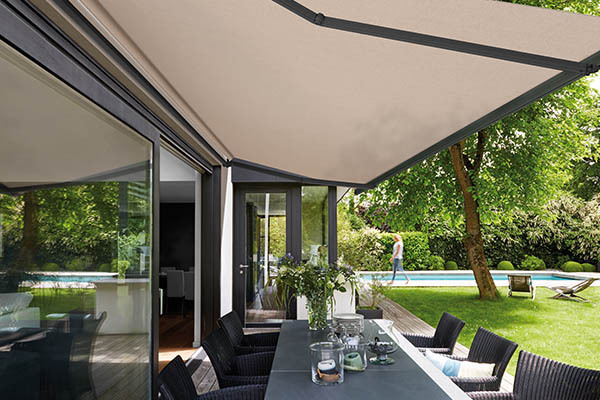 Orchestra MAX awning fabric is distinguished from Orchestra fabric by its colorless coating on one side, which makes it completely waterproof. Ideal for fixed and permanent outdoor installations, such as awnings and pergolas, Orchestra MAX fabric guarantees a very high level of colorfastness, excellent protection from UV rays and weather exposure, as well as easy maintenance. Enjoy your terrace to the full, whatever the time of year. All products are available in a width of 120 cm. 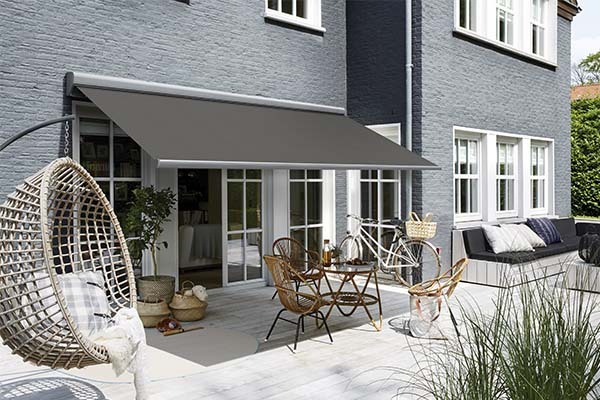 An extremely stylish, seamless awning. 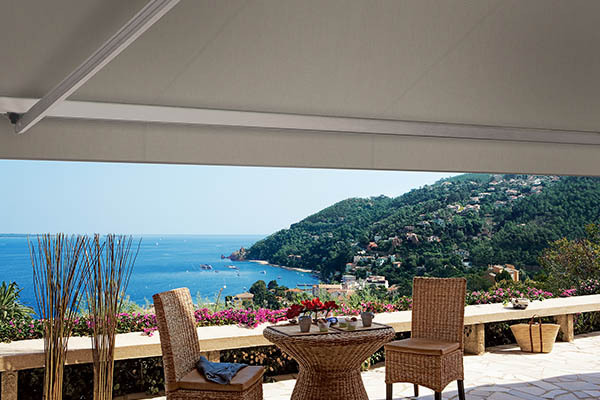 Dickson®’s Infinity range revolutionizes large-width awnings. 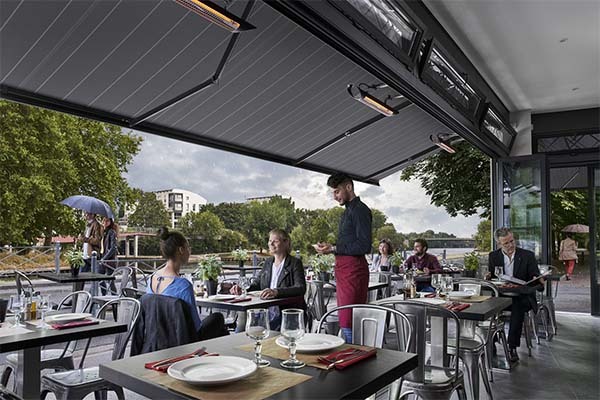 Its extra-wide 3.2-metre span allows you to create extremely stylish seamless solar protection awnings. Its unique woven structure ensures similar warp and weft resistance. 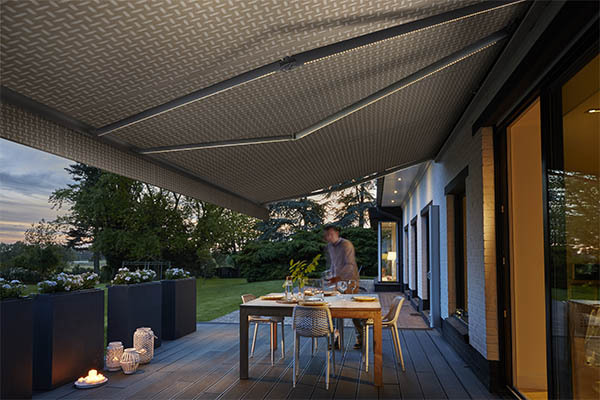 The awning is composed of a single piece of fabric, preventing variations in thickness and reducing distortions. Available in 15 plain colors, Infinity will add extra charm to your terrace. Dickson® has gone the extra mile by launching Replay, an original eco-design program. The idea is to recycle acrylic yarn to weave new textiles - yarn previously earmarked for outsourced recycling. Spool-end yarns are thus reused to produce new yarns. Dickson® is innovating, creating new processes and reinventing production through eco-design. Opéra fabric offers a wide selection of ultra-stylish patterns and colors to turn your building exterior into a design statement. Opéra fabric’s Jacquard weave creates original front and rear patterns. With its solution-dyed acrylic yarn and unique coating, the fabric is easy to maintain, and colors remain sharp year after year. Opéra products are available in a width of 120 cm.